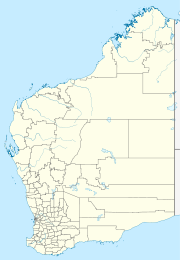 Kiwirrkura—officially known as Kiwirrkurra[A]—is a small community in Western Australia in the Gibson Desert, 1,200 km east of Port Hedland and 700 km west of Alice Springs. It had a population of 216 in 2011. It has been described as the most remote community in Australia. It was established around a bore in the early 1980s as a Pintupi outstation and became a permanent community in 1983. It was one of the last areas with nomadic Aboriginals until about that time. Although situated in a desert, it is in a low-lying area without drainage. It was flooded in early 2000 and further flooding between 3 and 5 March 2001 forced the evacuation of its population of 170, first briefly to Kintore and then for four weeks to NORFORCE's base in Alice Springs and finally to Morapoi Station in the Goldfields of Western Australia, 2,000 km SSW of Kiwirrkurra. The stay in Alice Springs and Morapoi brought the community into contact with alcohol for the first time and led to violence and social disruption. By late 2002 the community had moved back to Kiwirrkurra. Despite their displacement, on 19 October 2001 the Kiwirrkurra people gained native title over 42,900 sq km of the surrounding land and waters. On 19 June 2009 a 26-year-old man from Kiwirrkura was the first Australian to die of the 2009 flu pandemic; he was initially treated in Alice Springs hospital but he died in Royal Adelaide Hospital. Although the community name is gazetted as kiwirrkurra, the correct spelling (according to the standard Pintupi orthography) is kiwirrkura and this spelling is used in many printed materials and websites. In the past decade, a Perth Catholic boys' school, CBC Fremantle, has established an immersion partnership program with the local Kiwirrkura community to both further indigenous relations, improve local facilities and further the students' social and pastoral developments. Students and teachers organise trips about once a year. The Kiwirrkura community worked to establish the Kiwirrkurra Indigenous Protected Area which was formally launched in September 2014. ^ a b c Brinkley, Cath (February 2009). "Kiwirrkurra:the flood in the desert" (PDF). The Australian Journal of Emergency Management. 24 (1). Archived from the original (PDF) on 18 December 2012. Retrieved 25 June 2009. ^ Australian Bureau of Statistics (31 October 2012). "Kiwirrkurra (UCL)". 2011 Census QuickStats. Retrieved 3 February 2014. ^ "Kiwirrkurra – the most remote community in Australia". Biting the Dust. 25 March 2009. Retrieved 22 January 2011. ^ "Kiwirrkurra people return home". Australian Broadcasting Corporation. 13 August 2002. Retrieved 26 June 2009. ^ "Negotiations result in recognition of Kiwirrkurra people's native title rights". National Native Title Tribunal. 19 October 2001. Retrieved 26 June 2009. ^ Rickard, Jayne (25 June 2009). "Kiwirrkurra man did not die of swine flu". The West Australian. Archived from the original on 26 June 2009. Retrieved 25 June 2009. ^ "First Suspected Death from H1N1 Influenza 09 infection". Department of Health and Ageing. 19 June 2009. Archived from the original (PDF) on 22 June 2009. Retrieved 25 June 2009. ^ Pepper, Daile (19 June 2009). "WA man dies from swine flu". The Sydney Morning Herald. Retrieved 27 June 2009. ^ "Placenames search". Geoscience Australia. Retrieved 26 June 2009. This page was last edited on 9 February 2019, at 16:45 (UTC).